Buccaneer Books, 1994-06-01. Hardcover. Used:Good. New York: Henry Holt and Company, 1958. First Edition. SIGNED by J. Edgar Hoover on the front free end paper. A virulently anticommunist tract by the former head of the FBI. Near Fine (a bit of age-toning on the page edges) in a Fine dust jacket with only slight edge wear. 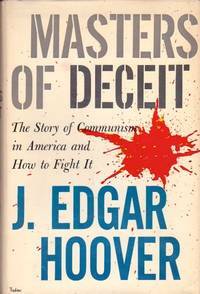 "The Communist Party, USA, works day and night to further the communist plot in America," J. Edgar Hoover writes. With chapters on who are the communists, why do people become communists, and advice on how to identify and combat "dangerous subversives." An interesting relic from the 1950s Red Scare. New York City: Henry Holt, 1958. 1st Edition. Hardcover. Fine/Near Fine. 8vo - over 7¾ - 9¾" tall. 1st Edition. Fine Copy In a Near Fine Jacket.First Edition Stated.$5.00 on Flap.Rare Presentation Copy. "To Helen Rusne Best Wishes J.Edgar Hoover 4/21/58." Signed in Year of Publication.Beautiful Copy. Masters of deceit: The story of Communism in America and how to fight it. New York: Henry Holt, 1958. 8vo. x, 374 pp. Third printing (stated) of Hoover's exhortation to fight the Red Menace. Presentation copy: This copy inscribed "To Sister Mary Jane / Best wishes / J. Edgar Hoover / Xmas 1958. Publisher's cloth, dust jacket in protective sleeve taped to covers; dust jacket with minor scuffing at corners and spine extremities, one crease to back, price clipped. Front pastedown with institutional bookplate; endpapers with offsetting from tape. Pages clean. Holt, Rinehart and Winston Sixth printing, 1960. Signed and inscribed by Hoover on front free end-paper. Book fine, except for slight wear at spine ends and corners. DJ very good, with some rubbing and chipping at spine ends and corners, minor rubbing and scratching along bottom edge of back, one small piece and two tiny pieces missing near top of back, small tear (1/4") at top of back, slight rubbing along back joint and back fold, minor discoloration on front and spine and spine inside DJ.. Signed by Author(s). Hardcover. 2005-12-23. New. Ships with Tracking Number! INTERNATIONAL WORLDWIDE Shipping available. Buy with confidence, excellent customer service! New York: Henry Holt, 1958. Fourth Edition. Cloth. Very good. Octavo, 374pp. Red cloth bindings with gilt title on spine and cover, replica signature in gilt over black. Inscribed by J. Edgar Hoover on front endpaper: "To Henry + Betty Kane / Best Wishes / J. Edgar Hoover / Xmas 1958." J. Edgar Hoover was the longest serving Director of the F.B.I., serving under an unprecedented six Presidents. This book was written in 1958, near the height of the communist scare in America. New York: Henry Holt, 1958. Second Edition. Cloth. Near fine/very good. Octavo, 374pp. Red cloth bindings with gilt title on spine and cover, replica signature in gilt over black. Clean pages and text in fine condition. Original publishers slipcase in very good condition, repair on spine. Inscribed by J. Edgar Hoover on front endpaper. J. Edgar Hoover was the longest serving Director of the F.B.I., serving under an unprecedented six Presidents. This book was written in 1958, near the height of the communist scare in America. 2013-10-27. Good. Ships with Tracking Number! INTERNATIONAL WORLDWIDE Shipping available. May not contain Access Codes or Supplements. May be ex-library. Shipping & Handling by region. Buy with confidence, excellent customer service! HENRY HOLT, 1/1/1958. Reprint. THIRD STATED PRINTING. Hardcover. Very Good. Signed. Inscribed by J. Edgar Hoover to fep, to Herman Edelsburg, former B???? ?nai B???? ?rith international council director, dated 1964. First edition and first printing. Hardcover and dust jacket mylar. Good binding and cover. Minor wear to dust jacket with some chipping to edges. Blemishes to page ends. Clean, unmarked pages. Ships daily. New York: Henry Holt and Company, 1958. First edition. Very Good/Very Good. Third printing. Very Good book with original publisher's cloth binding with some wear to corners; small nick with loss of cloth to top of rear board. In like jacket, with some chipping along the top edges and small closed tears to bottom of front panel and crown of spine. Jacket mildly foxed along the spine. Dampstaining to the top corners of pages 274-283 with paper loss to 277-278. With author's inscription to front endpaper "To Ferd G. Norris, Best Wishes Edgar Hoover 10.10.58" with original owner's postcard laid-in. Hoover's account of his work in the FBI seeking to combat what he perceived as the numerous Communist threats to American citizens. As the first director of the FBI, he developed the agency into a large crime-fighting organization and introduced the use of citizen surveillance and technologies including lie detectors and fingerprinting. Very Good in Very Good dust jacket. New York: Henry Holt, 1960. Sixth Printing. Cloth. Very good. Octavo, 374pp. Red cloth bindings with gilt title on spine and cover, replica signature in gilt over black. Light foxing on endpapers. Inscribed by J. Edgar Hoover on front endpaper, with JSA certification. J. Edgar Hoover was the longest serving Director of the F.B.I., serving under an unprecedented six Presidents. This book was written in 1958, near the height of the communist scare in America. New York: Henry Holt and Company, 1958. Third Printing. Hardcover. good/fair. 374 pages. Glossary, bibliography, appendices, index, small scratches to fore-edge, DJ worn & soiled: small tears, small chips missing. Presentation copy inscribed to Dr. John H. Hazard, signed by the author. also contains an invitation to Dr. Hazard from J. Edgar Hoover. Seller: Ground Zero Books, Ltd.
2010-07-07. Good. Ships with Tracking Number! INTERNATIONAL WORLDWIDE Shipping available. May not contain Access Codes or Supplements. May be ex-library. Shipping & Handling by region. Buy with confidence, excellent customer service! 2010-09-10. New. Ships with Tracking Number! INTERNATIONAL WORLDWIDE Shipping available. Buy with confidence, excellent customer service! New York: Henry Holt and Company, 1958. 374 pp. Original red cloth covers w/ titles in gilt. Binding very bright and clean. Modest rubbing to corners and spine ends. INSCRIBED AND SIGNED BY J. EDGAR HOOVER ON FRONT BLANK ENDPAPER. DJ lightly soiled w/ wear and few short tears to edges. Contents very nice.. Inscribed & Signed by Author. Hard Cover. Very Good+/Very Good. 8vo - over 7¾" - 9¾" tall. New York: Henry Holt. 1958. Hardcover. Fine in Near fine+ dj; Inscribed by Hoover to Wesley J. Harding, with Harding's bookplate on endpaper. ; Signed by Author . New York: Holt, Rinehart and Winston, 1966. Twelfth Printing. good. 374, glossary, bibliography, appendices, index, some wear to board corners and spine edges. Inscribed by the author. New York: Holt, Rinehart and Winston, 1961. Tenth Printing. good. 374, glossary, bibliography, appendices, index, some wear to board corners and spine edges. Inscribed by the author. 2011-05-01. New. Ships with Tracking Number! INTERNATIONAL WORLDWIDE Shipping available. Buy with confidence, excellent customer service! 2012-08-08. New. Ships with Tracking Number! INTERNATIONAL WORLDWIDE Shipping available. Buy with confidence, excellent customer service! 2005-12-23. Good. Ships with Tracking Number! INTERNATIONAL WORLDWIDE Shipping available. May not contain Access Codes or Supplements. May be ex-library. Shipping & Handling by region. Buy with confidence, excellent customer service! J.M. Dent & Sons, 1/1/1958. Third Printing. Hardcover. Very Good. Third printing. Inscribed with "Best wishes" on fep by J. Edgar Hoover. Dated 6/13/58. Stated First edition. Original red cloth. No dust jacket. Light rubbing. Crisp, clean and sound. J.M. Dent & Sons, 1/1/1958. Reprint. THIRD STATED PRINTING. Hardcover. Very Good. Inscribed on front flyleaf to Rear Admiral B.W. Hogan with "cordial regards" on fep by J. Edgar Hoover. Dated 6/13/58. Stated First edition. Original red cloth. No dust jacket. Light rubbing. Crisp, clean and sound. Holt. Collectible - Very Good. INSCRIBED! NY: Henry Holt 1958. Stated 1st. Hardcover 8vo 374 pgs. Inscribed 'Best Wishes J. Edgar Hoover' on front endpaper. Very good in a dust jacket. Light edgewear. Owner's name in ink to front endpaper. Contents clean and binding sound. Jacket edgeworn, chipped and has small edge tears. Owner's name in ink top of front panel. Inquire if you need further information. 2012-08-08. Good. Ships with Tracking Number! INTERNATIONAL WORLDWIDE Shipping available. May not contain Access Codes or Supplements. May be ex-library. Shipping & Handling by region. Buy with confidence, excellent customer service! 1977-01-01. Good. Ships with Tracking Number! INTERNATIONAL WORLDWIDE Shipping available. May not contain Access Codes or Supplements. May be ex-library. Shipping & Handling by region. Buy with confidence, excellent customer service! 2018-11-16. Good. Ships with Tracking Number! INTERNATIONAL WORLDWIDE Shipping available. May not contain Access Codes or Supplements. May be ex-library. Shipping & Handling by region. Buy with confidence, excellent customer service! Henry Holt and Company. Hardcover. Not Ex-Library - 1958 third printing - Signed by Author - 5 1/2" X 8 1/2" - 374 pages with index - tight binding - clean text - red board with gold lettering shows some shelf wear and handling wear - no dust jacket - We ship every business day and try to ship orders same or next business day. Purchase of this item will help support the programs and collections of the Johnson County (Kansas) Library. . Good. 1958. New York, Holt, 1958. First Edition. Fine cloth copy in a good if somewhat edge-torn and dust-dulled dw, now mylar-sleeved. Remains particularly and surprisingly well-preserved; tight, bright, clean and strong. ; 374 pages; Description: 374 p. 22 cm. Subjects: Communism --United States. Review copy with publisher's slip loosely inserted..
New York: Holt, Rhinehart & Winston, 1958. Hardcover. Good/Good. Good. Inscribed to a couple by J. Edgar Hoover on inside page, 12-25-60. New York, NY: Holt, Rinehart and Winston, Inc. , 1961. 5th or later Printing. Hardcover. Very Good/Good. 8vo - over 7¾ - 9¾" tall. Holt, Rinehart and Winston, Inc., New York. 1961. Hardcover. Inscribed by the author on the FFFP. Stated 9th Printing. Book is tight, square, and unmarked. Book Condition: VG+; light shelf wear to tips, head, tail, and bottom board edges. DJ: Good; price clipped; tape repair to tail, chipping on top edge; wear to photo JEH on rear from shelving. Red cloth boards and spine with bright gilt lettering on spine with author's name in gold over black shadowbox. 374 pp 8vo. The Director of the Federal Bureau of Investigation explains the startling facts about the major menace of our time, communism: what it is, how it works, what its aims are, the real dangers it poses, and what loyal American citizens must know to protect their freedom. A clean presentable copy in a Brodart mylar jacket. Kessinger Publishing, LLC, 2011-02-01. Hardcover. Good. Kessinger Publishing, LLC, 2005-12-23. Hardcover. Used:Good. Holt Rinehart Winston, 1962. Hardcover. Good Condition/No Dust Jacket. Signed by Author. 374 pages. 11th printing, 1962. Light wear to the covers; sound binding; pages toned with age. The front endpaper has a sticker tear at the top corner; a little lower it is signed "Best Wishes, J. Edgar Hoover". Quantity Available: 1. Shipped Weight: Standard Weight. Category: Biography & Autobiography; Signed by Author. Inventory No: 148736. .
A Beka Book Publications. Used - Good. Good condition. Mass Market Paperback edition. Short gifter's inscription on Slightly dampstained. J.M. Dent & Sons. Hardcover. B0053CQTC8 1958 Heny Holt hard cover - 1st edition 1st printing - minor wear to dust jacket (now in mylar cover) some staining to page edge - otherwise cover fine binding strong contents clean - enjoy . Very Good. Buccaneer Books, 1994-06. Hardcover. Good. D. Appleton, 1870. 1870 edition. Very Good condition. Bookplate. Complete in one volume. J.M. Dent & Sons. Hardcover. B0053CQTC8 New Condition. . New. Pocket Books. PAPERBACK. B000E9UFWU New Condition. . New. Ishi Press. PAPERBACK. 4871873374 New Condition. . New.